J.P. Andrade, ran, passed and even blocked on occasion to lead the Bearcats to the victory. (San Dimas) – J.P. Andrade threw for 354 yards and five touchdowns as Bonita held off Covina 40-33 Friday night at San Dimas High. The Bearcats survived four turnovers and numerous penalties before finally putting the Colts away. Bonita also let two touchdown leads slip away in the second and third quarters before getting separation in the fourth. Tied at 26, Aalias Williams took a screen pass from Andrade and raced 55 yards for a score on the first play of the fourth quarter for a 32-26 Bonita lead. The Bearcats then held Covina and took over at their own 42. Two plays later, Andrade hit a wide open Miles Mouradian over the middle who ran untouched 36 yards into the end zone. The two point conversion was completed on an Andrade pass to Jarratt Dancekelley to make to 40-26. There was still 9:32 left in the fourth but that play ultimately sealed the victory. The Colts scored late when Nin Burns II scored on an 11-yard run to cap an 80-yard drive. With 1:38 left on the clock Covina attempted an onside kick but Bonita recovered and that was all she wrote. The Bearcats opened the scoring on a 31-yard TD strike from Andrade to Williams in the first quarter to go up 7-0. On their next possession they coughed it up when Andrade was hit, the ball popped loose and Jahmal Clark scooped it up and rumbled down to the Bonita one-yard line. Erik Cuellar scored on the next play but the extra point was missed leaving the score 7-6. Nin Burns II came on in the second quarter and rallied the Colts. Early in the second quarter Kenny Coulson took an Andrade pass and outran the Covina secondary for a 48-yard touchdown. On Bonita’s next drive the Bearcats drove 64 yards on nine plays with Mouradian going over from two yards out to make it 20-6. It appeared that would be the score at the break but Burns, who didn’t start the game at quarterback but took over in the second quarter, led the Colts down the field and hit Danny Urrea Jr. in the corner of the endzone for a 20-yard bullet with no time left and it was 20-13 at the half. Bonita looked like it had regained control in the third quarter when Andrade connected with Michael Musharbash for a 35-yard scoring strike for a 26-13 lead. Again the extra point was missed. But Burns picked off Andrade on Bonita’s next series and Cuellar broke off a 62-yard touchdown run and Covina was right back in it. The Colts then tied it on their next possession marching 97 yards on 12 plays with Burns finishing it with a two-yard run. Bonita then pulled away with the two fourth quarter touchdowns. The Bearcats turned the ball over four times allowing the Colts to hang around. Cade Cadum had five receptions for 103 yards and Williams had six for 117 and a pair of scores while Mouradian had a touchdown running and receiving. James Duronslet started behind center for Covina as Burns was nursing a sore shoulder. But Burns came on in the second quarter after Duronslet got banged up and looked fine. He rushed for 57 yards and two scores and threw for 121. Cuellar was the workhorse for the Colts rushing for 172 yards and two touchdowns on 18 carries. 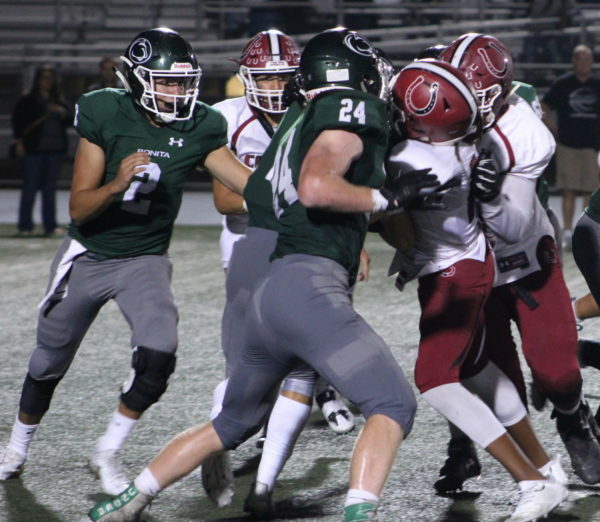 The Colts fell to 3-2 with the loss while the Bearcats improved to 5-0 on the field with the win but 4-1 after they were handed a forfeit loss this week for a game with Riverside Poly earlier this year when it was ruled that they had used an ineligible player. 25 Comments to "Bearcats Hold off Colts"
I agree with Viking. There was no reason whatsoever to bump Northview up to Division 7. Bumps this year made no sense. I thought we would go up to 10 but 9 is fine. They bumped Arroyo up to 8 also after we did better than them last year. Makes no sense. I am a vvl fan and a colt fan!! This is a very tough league, and yes it is very top heavy!!!! Northview, San Dimas, and Covina all have very good chances this year to win CIF in there respected divisions!!!! Now think what I just said that’s incredible and it’s true!!! Really bothers me when people come on here and don’t know what there talking about. Just blabbing stuff out just to say things. You can say this and that all you want. Until NV wins a road playoff game, or gets to a final there still a good, underachieving football team. 1. NV would do well in D5…… Stop. Just stop. 2. Neither NV or Covina has played anywhere’s near a top tier team yet and Northview has clearly done a better job so far against who they both played. 4. NV could likely face Millikan again. Millikan has 55 reasons why they would love to see that against NV’s 23 that they wouldn’t. Millikan is 3-2 but Ray Charles can see that they have played MUCHO tougher opponents than NV has. 5. I’m always…I repeat always… going to back my Colts and pick them against anybody. It’s kinda cheap to reference a quote someone makes before their DC was let go by the district. Just like it would be of me to boast if your QB or top receivers were out due to injuries. 6. TODAY I believe that Covina can, and will beat NV this year. Quote me on that one. And like anonymous said…if they don’t the sun will still come up the next day. 7. None of us posting suits up. We are all backing our kids and our coaches. I wouldn’t expect anything less. Clearly you make a very poor argument. First off you have not seen Northview up close. They have no weak spots. D1 one prospects at skill positions. Speed to throw away. Next they play in different divisions. Saying Covina has a better chance is like saying Cabrillo has a better chance than LB Poly. It is apples and oranges. Of course Cabrillo has a better chance than Poly when Poly has to play #1 or #3 in the nation first round. That said, at home or on the road Northview plays great no tricks football. Here we come stop us. You might once in awhile but never more than a quarter. Meanwhile Covina gets a Muir first round. Lotsa luck with that. Just a high school fan but this Northview team would do well in D5. South Hills and Northview would be some game. I’ve said it once and I’ll say it again. Northview has the edge against Covina because they need to win the VVL. Anything less than a league title means a lower seed in the playoffs and a long bus trip in the 2nd round. Northview cannot win a playoff game on the road. A high seed helps there cause. 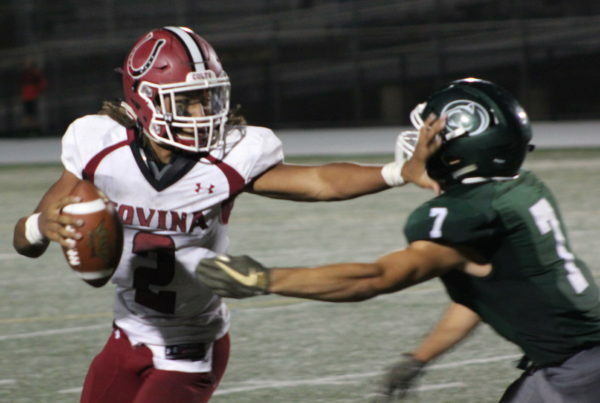 Covina has demonstrated that not only can they win a road playoff game but can get to a final. As much as Covina would like to beat NV for bragging rights it won’t kill them if they don’t. Prediction: NV wins VVL and gets bounced in the 2nd round. Covina finishes 2nd and gets back to a final. You right, I used the wrong word. You used thump. I meant to write thump in my last post when I said sorry. “But by all means raise those banners in your Gym for beating Covina for 6 years. I know we will raise the one this year when we thump Northview. Seems I was right about the NV coach spin-up too! Careful Viking. You are going to make the baby Shetland toss another tantrum. BTW I’am the one driving up the hits. Sorry, I used the wrong word. You said Covina was going to throttle Northview. January 2nd, at 11:05am. It’s ok though, you don’t have to be impressed by Northview. Nobody thought they’d be 5-0 right now. Everybody doubted them because of Comstock leaving, your not the only one. I’m sure many people are still doubting them. Do I get frequent flyer miles if I keep stirring the pot and driving up the post count? You call Covina the Shetlands and you want to call me a 5 year old. You are a troll. Wear the badge proudly. Yes. I saw Northview. Not impressed. Forgive me ??? Link me to where I said “throttle”. My memory ain’t what it used to be, and that word is not normally in my vocabulary so I would be interested to see when I used it. I’m sure I said this was our year to beat you though. Not changing MY opinion. Forgive me?????? Always amusing when all a blogger has as a reply is to call his target a Troll over and over. Very original. What are you a five year old? Not even a little fun crossing swords with you. That said have you seen Northview. I hear they have not even played their B game yet much less their A game. Now, now kids. Take it easy. This will be settled on the field Friday 10/12. No need to bash on each other. Both teams are good, including San Dimas. If anything, I want our schools to do good against other leagues so we could show how strong the Valle Vista league is. Really excited and anxious for that Northview vs Covina game though. This is supposed to be Covina’s year to beat Northview according to Colts earlier post during summer. I believe Colt said Covina was going to throttle Northview. Put down 2 team you are not playing from another league that your school would not schedule because they are not 3 divisions lower than you. Hey Colt 44 what’s up. I’am hardly a coach and was agreeing with you. Brain farts, doo doo and mistakes are how the Shetlands played YOU Wrote. Should have beaten Bonita you said. Blind Stevie Wonder could see that you opined. Why blame your own take down of the Shetlands on NV. Is that sad Peterson. I have seen Bonita and they will get rolled in the Palomares other than hapless Claremont who should be in the Monte Vista League or Rio Hondo. I love when Northview coaches post. Covina aint Colts they are Shetlands. Beaten up by Bonita? Sad. From T. Peterson: Two things here: 1. Beaten up? They lost by a touchdown with their starting quarterback not playing until the second quarter. 2. Have you seen Bonita? They’re a good team. Undefeated – on the field. Losing to Bonita is nothing to hang your head about let alone “sad.” You missed it on this comment. I come on here and post “MY” honest opinion of how the kids are playing…which is with Brain farts, mistakes..etc. These are mostly Juniors and Sophomores and above all… kids. I have not missed a game in 8 years? I volunteer my time every game to help set up and tear down. I encourage the kids on the sidelines. Who realizes what my colts are more? Me or you? How many of our games have you been to? CVUSD let go our DC just before season started. Burns was playing baseball the week before our first game. We should have beaten Bonita and Los Altos. We didn’t…but doo doo happens. They are called Brain Farts and Mistakes. Our defense needs work. Stevie Wonder can see that. We are giving up an average of 30 points a game. That won’t cut it in the long run. Those super tricky 8 yard short slants over the middle burnt us all night on Friday. Why??? Got me! But I don’t suit up and am nothing more than an alumni and super fan. I’ll be there no matter what supporting the kids and the coaches. We’ll either get it figured out or we won’t. My money is on we will. These are good young men and they want it. And the coaches are busting their butts to make the needed corrections. We will be fine. Hate on Covina all you want. At the end of the day it means nothing. It affects them as much as a snowstorm in Canada. You were given reasons why Burns was played where and when in my earlier post. Comprehension of what I posted is on you. Yea, pretty true. Shoulder hurting, and your playing defense? Isn’t that risking injury as well? Pretty dumb of the coaches than. The reasoning for Burns not playing qb is ridiculous. The coach feels he needs to rest his qb because his arm is hurting so he can play defense? Colt you come on here every week and say the same things “mistakes” “brain farts” “sloppy”, one of these days you will just realize that your colts are what they are. Just to also add…His arm was bugging him on release of the ball. He didn’t even know he hurt it till it started bothering him well after last weeks game. Since it was preseason THE PLAN was to let his rest it from throwing, hence he was in for defense. But he got in for a drop kick on office and then when our backup QB took a shot and was shaken up he was put in. He only had a couple of minutes in the first half but played all second. Only losing by 7 with him out for almost half the game makes one wonder…what if….if he had been in the whole game? Our backup kept us in it though so prop to him. Why didn’t Burns start the game at QB? Maybe you can shed some light on this Colt74? I read to protect his shoulder because he is injured, is this correct? But if true, it doesn’t make any sense. He was starting on defense, a little bit confused here. From T. Peterson: Word is his shoulder on his throwing arm had been bothering him all week and the plan was that he wasn’t going to play, especially since this wasn’t a league game. But the starting QB (the backup) took a shot and was banged up forcing the HC to put in Burns. He looked ok and it didn’t seem to be bothering him so he played the rest of the way.